May Arts and Penny Black are collaborating for a week of fun and inspirational projects. Make sure to pop in daily because there will be a PRIZE EACH DAY! How cool is that? I'm first up this week with 2 super simple projects. I used the versatile Penny Black Gratitude Sentiment set. 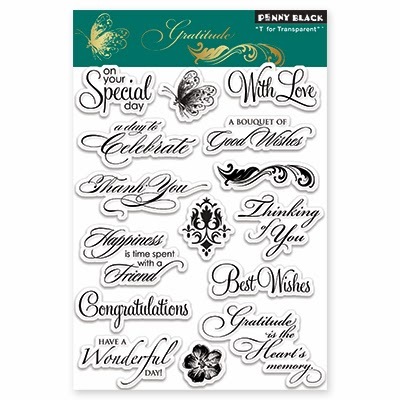 This set has elegant sentiments for nearly every occasion. First up is a CAS card. That cute graphic came right on the paper. I just stamped my sentiment, added May Arts 5/8" Solid Plaid ribbon in a perky little bow, some bling and done! Next up is sweet little gift jar. It can hold anything from ribbons or buttons to jam and takes just minutes to put together. I think it's nice to have some little gifts on hand for saying thank you, happy birthday or a quick get well. and this Penny Black Gratitude set has it all covered. I hot glued May Arts 1.5" Net Ribbon around the jar. Ribbon is so much easier to fit around odd shapes than paper is. Once my net ribbon was secure, I added some fun May Arts 1/2" Pom Pom String over the net ribbon. Next, I stamped the Penny Black sentiment on a paper doily. I cut a ring from some DCWV Dear Jane paper stack and Spellbinders Scalloped Circle dies and glued it over the sentiment on the doily. A little bling from my stash finished of the top. I hot glued May Arts 1/2" Woven Burlap around the top of the lid, then added May Arts Mini Pom Poms over the burlap. That ruffled edge on the doily was created by cutting off the edge with scissors. That's it for me...next up is Ribbonista Courtney Lee! Be sure to head over the Penny Black Blog as well for even more inspiration and chances to win!